Companies investigated over “green” claims. 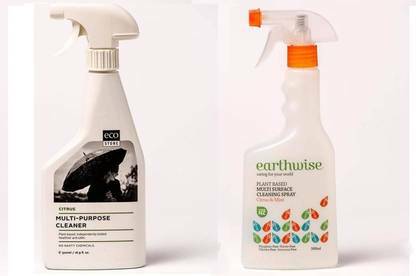 Two "green" cleaning product manufacturers, Earthwise and Ecostore, have been warned by the Commerce Commission that claims made for some of their products risked breaching the Fair Trading Act. Earthwise was warned in December 2012 about a claim its products were "phosphate free, nitrate free, chlorine free [and] ammonia free". The claim appears on all Earthwise products. But the commission considered its use on some of these products risked breaching the Act as the chemicals hadn't historically been used in competitors' products. Ecostore Multi-Purpose Cleaner, Earthwise Multi-Surface Cleaner. The commission has previously cautioned companies against advertising environmental benefits that aren't relevant. Its green marketing guidelines, released in 2008, state claims for the absence of a harmful chemical or damaging effect are unacceptable if other products don't contain that chemical or have that effect. The Earthwise warning follows a similar warning given to Ecostore in August 2012. After a lengthy investigation that began in 2011, the commission warned the company that "ammonia free" and "nitrate free" claims on its automatic dishwashing tablets, laundry powder and cream cleanser risked breaching the Act. While the claims were "strictly speaking true", the commission considered they misleadingly implied the chemicals were used in competitors' products. Although the commission considered it had sufficient evidence to bring court proceedings, it decided to issue warnings only. Its competition manager Greg Allan says the fact that Ecostore had admitted its conduct and amended its packaging to remove the claims was taken into account in the decision not to take the matter further. Ecostore's Malcolm Rands told us the company agreed the claims weren't relevant and had already removed them from packaging in early 2011, before it received the warning from the Commerce Commission in August 2012. Earthwise is yet to make any changes to its packaging. While the warning doesn't direct the company to do this, the commission says it would "expect Earthwise to amend its packaging where it does contravene the Act". Several other claims made by Ecostore have resulted in the commission issuing it with compliance advice. Greg Allan says Ecostore's claims that its products contained "no toxic petrochemicals" and "no nasty chemicals" were potentially misleading because the products did contain petrochemicals, and other chemicals listed as being excluded "weren't universally accepted" by scientists to be harmful or toxic. A "skin friendly" claim on the laundry powder was also seen as potentially misleading. An expert engaged by the commission to assess the product found it contained ingredients that could cause skin irritation. Ecostore told the commission that the petrochemicals it used had a "lower health and environmental profile" but said it would ditch the "no toxic petrochemicals" and "no nasty chemicals" claims. The company's Malcolm Rands subsequently told us Ecostore was "progressively adjusting our labels to be more specific as to each and every chemical". It won't be dropping the "no nasty chemicals" tag entirely and plans to use it for a web address. The "skin friendly" claim has already been removed from the laundry powder. Mr Rands describes Ecostore as an "enthustiastic partner" in the investigation and says it "highlighted to us the need to educate people [about] the safety of chemicals in everyday products," though the company acknowledges there's scientific debate about some chemicals. 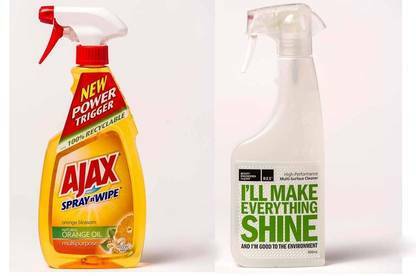 While Ecostore and Earthwise have been in the gun, there's an increasing amount of green noise in the cleaning products aisle – and assessing whether a product's claim to "greenness" stacks up isn’t easy. Ajax Spray n' Wipe Orange Blossom Multipurpose, BEE Multi-Surface Cleaner. Manufacturers of household cleaners aren’t required to disclose exactly what’s in their products. Current regulations require chemicals with certain hazardous classifications to be listed on the label only if they’re present above prescribed levels. Of 6 cleaning products we bought that made some kind of "green" or "natural" claim, 5 out of 6 failed to provide a full ingredients list (see our table below). While other factors are also relevant in assessing a product's "green" credentials, information about what's in it is a basic starting point. Ajax Spray n' Wipe Orange Blossom Multipurpose boasts it's "100% recyclable" and contains "natural orange oil". But the packaging doesn't disclose how much orange oil is included or what else is in the product. The ingredients list unhelpfully refers to "solvents to dissolve grease, cleaning and sudsing agents". Manufacturer Colgate Palmolive says the product contains "orange essential oil and natural related extracts" but "due to the confidential nature of our product formulas, we cannot disclose further information". While new packaging doesn't include an ingredient list, it says consumers can find additional ingredient information on its Australian website. Green Works Natural Multi Purpose Cleaner claims to be "99% natural" with a dash of synthetic preservatives and green colourants. Manufacturer Clorox says the cleaner meets the requirements of the Design for the Environment programme, a certification scheme run by the US Environmental Protection Agency. But a full ingredients list isn't provided on the bottle. Until recently, Design for the Environment hasn't required ingredient disclosure on product packaging, a criticism of the scheme made by our US counterpart Consumers Union in testimony to the US Congress. It's a criticism that can also be made of other eco-labelling schemes. For example, Next Generation All Purpose carries the "Green Tick Certified" logo. The Green Tick programme sets broad safety and environmental criteria but doesn't prescribe specific standards for cleaning products. Ingredients also aren't required to be listed on the packaging. This cleaner also carries an "eco Planet" trademark – not a certification mark but a logo developed by Quantum Pacific, which owns the Next Generation brand. Environmental Choice, a New Zealand government backed eco-label that appears on BEE's Multi-Surface Cleaner, doesn't yet require full ingredients disclosure. Its "General Purpose Cleaners" standard requires only some ingredients to be listed by name on the packaging. Others, such as surfactants, can be shown by type. The label's general manager Robin Taylor says companies must fully disclose product content when they apply for certification and ingredients are assessed for toxicity and degradability using international benchmarks. Taylor believes the Environmental Choice logo "has greater relevance and meaning for consumers than an unexplained list of often complex ingredients". However, he is "broadly supportive of any moves to increase transparency." The standard is due to be reviewed this year. Environmental Choice has also developed its own guidelines on green claims. These guidelines caution companies against using terms that imply a certified product is environmentally beneficial or environmentally benign. But there's room for "creative licence". BEE's front-of-pack claim "I'm good to the environment" is viewed by Environmental Choice as an example of acceptable "creative promotional language". The Fair Trading Act prohibits companies from making false or misleading environmental claims about their products. But the onus of proving or disproving claims rests largely on the Commerce Commission and individual consumers. It's ultimately up to the courts to determine a company's guilt or innocence. If passed, law changes now before Parliament will ban companies from making unsubstantiated claims about their goods, which may help nudge the onus of proof on to businesses. But it will still be up to the courts to decide whether an offence has occurred. Given the high cost of court action, prosecution won't follow in every case. We've previously called for the commission to have wider powers to fine companies – without the need to go to court – where there's a clear-cut breach of the law. The expanding market in "green" claims is one where fines could help significantly to clamp down on misleading claims and improve consumer protection. Companies making "green" claims need to make sure they have good evidence to back them up. If they haven't, they shouldn't be making them. If you think a company's making a false or misleading environmental claim, complain to the Commerce Commission. Guide to the table Our information is from the products' packaging. "All ingredients listed" shows a 'no' where specific ingredients are not listed by name on the bottle. Along with water, common ingredients in household cleaning products include surfactants, builders, solvents, preservatives, fragrances and colourings. Surfactants reduce surface water tension and help the water to surround and remove soils. Builders are used to reduce water hardness and improve the performance of surfactants. Preservatives are used to extend the shelf life of products. Colourings and fragrances are used for “cosmetic” purposes to make cleaners look and smell appealing. If you want a "greener" cleaner, use ingredients in your kitchen cupboard. Baking soda is a good all-purpose cleaner. Use it in the bathroom to clean the bath and basin. In the kitchen, it works well for removing stains from benchtops and other surfaces. White vinegar is another good stand-by and can be used to clean chrome and cookware. Lemon juice is an option to lighten stains and cut through grease. It can also be used to clean brass, copper and bronze. How about Melaleuca and Norwex products? I clean my whole house using either Enjo cleaning cloths/mop (uses only water and enjoys 'marble paste' for soap scum), and bicarb & vinegar for toilets. I get great results and it saves me money and reduces the number of chemicals I use and waste I produce. I highly recommend it. I have just looked at the Enjo website and though their products sound really good, they are extremely expensive, especially the cloths. These are probably out of reach of the average person's budget.